Whether you’re trying to avoid Windows 8 or just considering something new, you might be thinking about switching to a Mac. One thing bothers you, though: can you keep your data? Basically: yes. While there are certainly some Windows programs that you can’t take with you to a Mac, that’s not true of the software most people use regularly. And if you’re a typical computer user, most of the files you have on your PC will open on a Mac, without the need for any additional software. Buying a Mac or Macbook is one thing, but we simply don’t know how we can keep/use our Win files, e.g. Word, Excel, PPT and transfer them to a Mac, and still open these files *without* buying the extra Windows for Mac software. To begin answering this question: there isn’t really such a thing as a “Mac file” or a “Windows file”. Files are opened by programs, and most major software is available for Windows and Mac computers alike. This means that, while you’ll be able to open your files on your Mac, you can’t take most of your software with you. Of course, this gets more complicated. There is some software you can take with you, and there might be files you can’t open. Let’s go over what you can do first. Documents: You can open Word, Excel and Powerpoint files on a Mac using iWork, which comes free with new Mac devices. If you prefer, you can also purchase Microsoft Office for Mac – it’s not free, but it is familiar. Photos: You’ll be able to open any photos from your PC on your Mac, using the default Preview tool (or simply by selecting and hitting the spacebar). You can also install advanced images editors, such as Photoshop or GIMP. Music: Most music you have on your PC can be opened on your Mac with iTunes – MP3 and M4A, for example. DRM-protected music from a source other than iTunes might be a problem, but is relatively rare. Video: You can open most video files on a Mac using Quicktime, which comes with your Mac. If a file won’t open, you can install VLC How to Watch Entire YouTube Playlists in VLC How to Watch Entire YouTube Playlists in VLC Do you love YouTube playlists, but wish you could watch them outside your browser? You can use VLC for the job, thanks to a simple extension. Here’s how. Read More – the same way you do on Windows when Windows Media Player won’t open something. Bottom line: most files you use on your PC day-to-day will open on a new Mac just fine. Of course, it’s possible you use a couple of less common Windows programs, that use obscure filetypes, that won’t open on your Mac. Depending on the software, you may be out of luck, so be sure to contact the developers of any work-critical software you use before making the switch – they might offer a Mac version. Can Your Software Come With? Mostly. If you read MakeUseOf and you love your free software, apps like Dropbox, Evernote and Skype are what you live by. The good news: your Mac can run almost all of this free software, right now. Check out our list of the best Mac apps for a quick overview, or use GetMacApps to quickly install a variety of free Mac software New Mac? Don't Waste Time Installing Free Software; Use GetMacApps Instead New Mac? Don't Waste Time Installing Free Software; Use GetMacApps Instead Setting up a new Mac? Download and install your favorite apps all at once. GetMacApps.com makes it easy. Read More . With that out of the way, here’s the somewhat crappy part: if you’ve paid for software, you probably need to pay for it again. If you purchased the Windows version of Microsoft Office, for example, you’ll need to purchase the Mac version to use Office on your Mac (or get used to using iWork instead How the New iWork for iCloud Works With Your Apple Devices How the New iWork for iCloud Works With Your Apple Devices iWork for iCloud is a suite of online office applications (consisting of Pages, Keynote, and Numbers) that sync with the Mac and iOS versions of the programs. The online versions of iWork mirror most of... Read More ). If you purchased Adobe’s Creative Suite for Windows, you’ll now need to purchase the Mac version Microsoft Office for Mac: Is It Any Different? Microsoft Office for Mac: Is It Any Different? There have traditionally been both good and bad differences between the Windows and Mac versions, so we were wondering if this was still true today. Read More . There are some exceptions, notably software subscriptions. If you pay for Microsoft 365, or Adobe Creative Cloud, you’re entitled to use the Mac version of those programs as part of your subscription. And while most games you’ve purchased for PC won’t work on your Mac, you can play Mac versions of many games you’ve purchased on Steam. As a rule of thumb: software you’ve purchased online might well work on your Mac, while software you’ve purchased in a physical store and got on a CD probably won’t. How does transferring your data work? You have a couple of options. If you own an external hard drive, you can simply copy the files you want to use that way (here’s how to fix the “read only” problem How to Fix Your External Hard Drive Being "Read Only" on Mac How to Fix Your External Hard Drive Being "Read Only" on Mac Is your external hard drive showing up as "read only" on your Mac? Here's how to fix a locked Mac drive and get it working again. Read More , if you run into it). There’s also an easier way – one that will migrate not only your files but also your user accounts, email settings and more. It’s called the Mac Migration Assistant, and it automates the process using your home network. It makes the process painless, and is free to use. Download the Windows Migration Assistant. You know how I said you can’t run Windows software on your Mac? I kind of lied. There’s a way to do it, but it’s not easy – but if certain software is must-have for you, it might be worth looking into. A program called Wineskin creates a compatibility layer for certain Windows software to run in. 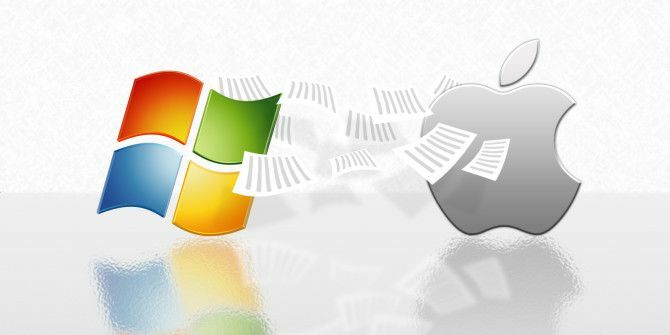 You’ll want to read about the entire process Wineskin: Run Windows Software on Mac Without an Emulator Wineskin: Run Windows Software on Mac Without an Emulator Install Windows software on your Mac without the need for a virtual machine, an emulator or dual-booting. Wineskin is a Mac app that brings Wine to your Mac, OS X style, allowing you to create... Read More before doing this, and it’s not recommended unless you consider yourself computer-savvy. You might also want to look into running Windows on your Mac desktop inside a virtual machine What Is a Virtual Machine? Everything You Need to Know What Is a Virtual Machine? Everything You Need to Know Virtual machines allow you to run other operating systems on your current computer. Here's what you should know about them. Read More , particularly if there is software you feel is critical. Parallels Desktop is capable of running the entirety of Windows on your Mac, as is similar virtualization software VMWare Fusion VMWare Fusion 6 Opens Windows On Your Mac VMWare Fusion 6 Opens Windows On Your Mac While Apple provides Bootcamp, a built-in OS X application for installing Windows on your Mac, virtualization program VMWare Fusion 6 allows users to run Windows without restarting their Mac first. Read More . For a free alternative, look into using VirtualBox, free virtual machine software for Windows, Mac and Linux. This is resource intensive, but if you really want to make the jump to Mac but utterly depend on certain Windows-only apps, it might be your best option. The vast majority of computer users can switch to a Mac without much effort. Most of the files you open day to day will work fine on a Mac, without much effort. Most free software you love also works on a Mac, but much of the software you paid for can’t come with (with a few exceptions). There are a few ways to get Windows-only programs working on a Mac, but none of them are simple. Don’t forget to check out our guide, Switched: The Convert’s Guide to the Mac & OS X for a more detailed look at making the leap. I hope this clears things up. Let me know about any questions you have in the comments below! I have Windows 7, not Windows 8 by choice, installed on a 2011 model MacBook Pro. I installed it without a hitch in its own partition, following Apple's directions for BootCamp. I now have a PC, that runs fast with no loss in performance for the few occasions when I need to use Windows. You do have to restart the computer if you're working in the Mac environment to switch to Windows, but for many users, this is a minor inconvenience. You can do the same moving from Windows or Mac to Linux, as well. Just saying. Oh, certainly! But this article is specifically for people considering the switch to Mac. That doesn't mean there aren't also people switching to Linux, just that this article isn't written with them in mind. Yeah, Quicken for Mac has some issues. I got Quicken working using something called Wineskin Winery, which is lighter than Parallels, but whatever works for you is great.